Promax Nutrition Canada – Best Protein Bars In Canada! Looking for a snack that not only tastes great, but is high in protein, vegetarian friendly and certified gluten-free? If so, Promax has your solution. 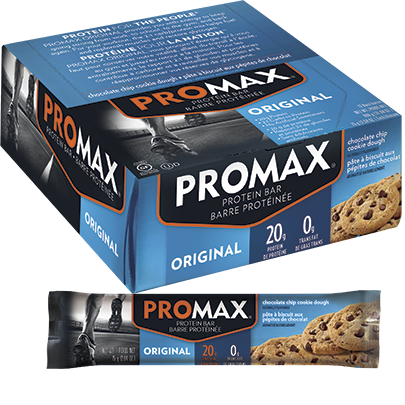 Promax energy bars are designed with the active, busy person in mind. They provide solid nutrition wherever you go and are ready whenever you need them. Complete with 18 vitamins and minerals, these bars are so flavourful, it’ll be one protein-rich snack you look forward to day after day. At Promax, we recognize you work hard towards improving your health and make sure our products will provide lasting energy to fuel your workouts or your busy day. They’re delicious, nutritious, and satisfying – and will show you how enjoyable healthy eating can be!